This is a wonderful creative nature craft. A chocolate rose keep sake is a gift that keeps on giving after the Valentine’s Day holiday is over. Place this eternal beauty in a bud vase for your viewing pleasure. Pull out four inches of wrap, cut in half so you have about a four by four square. Place two kisses flat end back to back to make the rosebud. Pull and cover the bud with the wrap. Tape up any loose ends. Cut floral wire into six inch length stems. Push end of wire into chocolate rose bud until it can not go in any further. Make a slight cure in the wire leaves. Place one leaf near rosebud and wrap the thin rose wire down the wire rose stem. Take the second leaf and place it an inch below the first leaf on the opposite side. Wrap the wire around the stem. Cut off about eight inches of floral tape. Starting at the top, cover the wires and stem with floral tape. Starting from the top of the stem, wrap the gold pipe cleaner around the rose stem. This rose never needs watering, and will never die! Enjoy and happy holiday! There was a need in our community for a garden club. 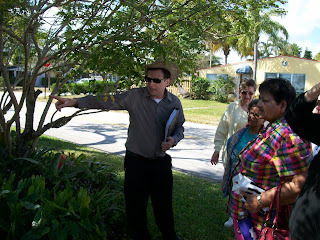 People had many plant questions and needed information and some motivation on how to get their gardens in tip top shape. I posted a message on the facebook page of our association. See the post below. Just pick out a topic, you can teach it or have a guest speaker, someone who is a garden guru. We will meet at a different homeowner's garden each month. Refreshments are served. (Everyone loves a snack!) Give yourself about 20 minutes for a garden tour, 20 minutes for the lecture topic and 15 or so minutes to eat. Then give out cuttings from the garden or small seedlings you started. At some meetings they have plant raffles or everyone brings in plants, they sell tickets (.50 cents a piece) to defray costs of the meeting; (Mailings, handouts and refreshments.) To keep costs down each person can bring refreshment and use the internet instead of mailing. You can get people from your church or synagogue, PTA, gym, or people from work to start a garden club. Attention all green thumbs we are starting a brand new club called the Poinsettia Heights Garden Club. We will meet on the last Sunday of the month at 10:00 am starting this January 31st. This is for beginners or experienced gardeners. Each month we will meet at one of our neighbor’s gardens. A new and exciting topic will be presented. Be prepared to learn a lot, take home cuttings to grow plants,and make new friendships. Refreshments served. Have fun with it and let me know how it goes!